Premium Flash Templates - Create perfect SWF slideshow with editable .fla file. Photo Slideshow Maker releases a brand new category of templates -- Premium flash templates, which is specially designed for the flash lover who need a handy tool to create stylish website slideshow. With Premium flash templates, you can now edit *.fla file and use stunning slideshow template to create standalone SWF slideshow that best fit your website. Photo Slideshow Maker helps you create wonderful flash slideshow with photos, music, text, transitions, effects, links and templates, then burn to auto-run CD/DVD, or upload to our free web album Go2Album, social websites or your own website. Unlike the templates in basic or advanced theme tempates, the premium templates is totally new on both the template background and customize settings, offering you more choices for make a gorgeous slideshow. With Premium flash templates, you can create a simple photo slideshow (with SWF file and HTML document) but with plenty of customizing options. You can customize the slideshow by adding music, url links, title, effects, etc. adding preloader with different styles, applying 60+ cool transition effects. Want to know more about how to create slideshow with Premium templates, please visit How to create Premium Slideshow. Premium theme template includes beautifully-designed flash templates with graphic decorated background. Here are some of the premium templates. Apart from the preset beautiful premium templates in the program, you can get more stunning and editable premium templates on How to custom Premium flash templates. We will update more gorgeous templates according to our user's valuable feedbacks in the future. In this beautiful set of templates, there are templates with animated graphic decoration, simple template without any button, elegent template with thumbnail display. 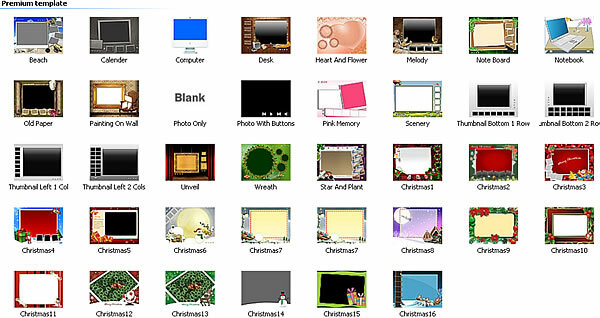 To celebrate the coming Christmas, we specially design a set of Christmas theme Premium templates. Want to see gorgeous slideshow that created with the Premium Flash Templates, please take a look at Premium Flash Templates Showcase. 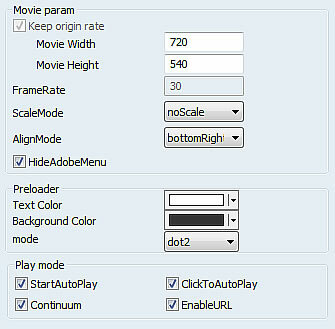 Movie Width & Heigth: You can define the width and height of the sideshow to fit your website. Scale Mode: There are 4 options for choices: no border, extract fit, no scale, show all. Align Mode: Choose align mode you need. Hide Adobe Menu: Hide the adobe menu if you don't need it. Text Color: Select text color for the preload. Background Color: Change the preload color according to your slideshow style. Mode: You can decide the preload style in this section. The Preloader in the Premium templates of Photo Slideshow Maker is now editable. You can create a stylish preloader on your own by customizing it yourself! Note: You have to install a version after V5.30 to get the downloaded Preloader work. Start Auto Play: Enable slideshow to display automatically, if you would like to display manually please uncheck this item. Click To Auto Play: If you would like to make the audio stop at where you click please uncheck this item. Continuum: Enable your slideshow to display continunually even when you are clicking on the photo. Enable Links: Make url links active on the photo, uncheck to disable links. With Photo Slideshow Maker, you can easily create and embed the premium flash to your personal websites or to our free photo album hosting service Go2Album to share with friends. What's more, your can also use the Go2album embed code to add the slideshow to MySpace, Blogger, Live Space, Yahoo 360, WordPress, LiveJournal, and all social websites and blogs that support editing HTML code. The new release Premium flash templates upgrade you experience on slideshow creating. Why not download and create your own premium slideshow for sharing?